Last evening saw the Midlands Food Drink & Hospitality Awards honour TV personality & Birmingham’s original Michelin-star chef Glynn Purnell with a Special Recognition Award for his support of the independent restaurant scene and putting Birmingham on the culinary map. 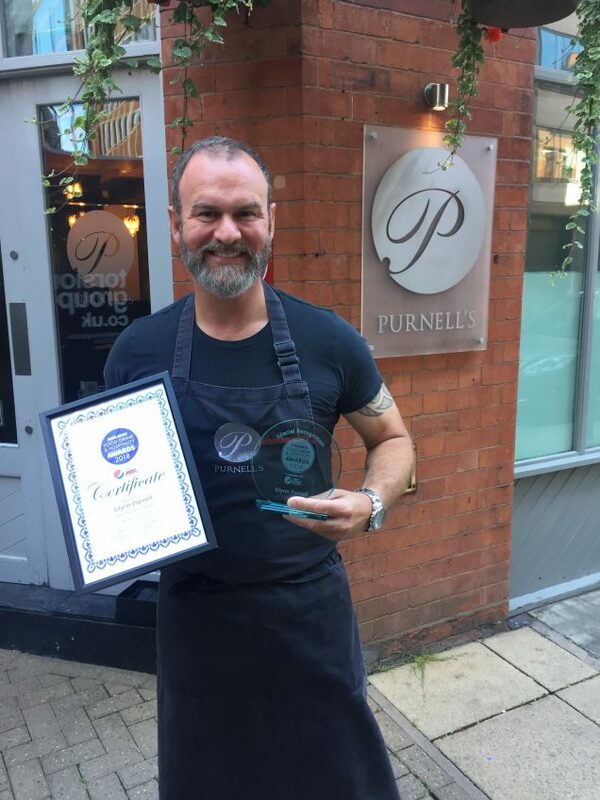 “Myself and the whole team at Purnell’s are delighted to have won the three awards at the Midlands Food, Drink and Hospitality Awards on Monday evening. My personal congratulations go to my Restaurant Manager Sonal Clare, who has now won two awards in the last couple of months (this, and the GQ Award for Best Sommelier) which recognise his huge level of skill as a Sommelier. On a wider level, my huge congratulations go to the whole team at Purnell’s, as every single member of staff plays a massive role in us winning the Best Michelin Star Restaurant award. The Midlands Food Drink & Hospitality industry was out in full force and saw over 450 people in attendance, including the biggest names and faces in the food and catering industry from all around the West Midlands, to honour and award the very best restaurants, cafes, eateries, chains, hotels, chefs and more in the world of hospitality. The MFDH awards was again this year headline sponsored by Pepsi Max, with diamond sponsors NFU Mutual, Swallow Drinks, Evolve Hospitality and category sponsors Britvic, Pathway Group, Three Church Road, NA Consulting, Midlands Retail Forum, Illy, Freedom Brewery and Adapt Accountancy. The night kicked off with a stellar reception that welcomed the guests, hosts, judges and sponsors to the beautifully decorated venue at the cricket ground. It was an electric night full of fun and frolics. Host Raaj Shamji, known for his flamboyance and infectious humour, and his eclectic band kept the guests entertained with their unique brand of wit, wonder and flair. They brought a sense of cabaret, zest and fun to the night that kept everything up and lively. Live music was provided by the Walsall Wallaz and Beat Asylum, guests were also treated to a surprise appearance from Gordon Ramsay lookalike Martin Jordan. Drinks were aplenty at the bar and food was provided from Mahir’s Experience. The delectable cuisine was perfectly fitting for a night celebrating the very best in food. Needless to say, when it came to the winners, the level of excitement and tension was palpable. Some of the most coveted awards and winners of the night included Best Fine Dining Restaurant which went to Cheals of Henley, Best Steak House which was awarded to the Andersons and Best Chef which was picked up by Liam Dillon of The Boat Inn. The crowd moved to the after party after the awards was over, which saw yet more fun, laughs and partying with music provided by DJ AKB. Next year’s MFDH awards is already being planned and looks set to be even bigger, better and brighter. Look forward to seeing you next year! For images from the night, see the links below. More will be released in the coming days!